These days most of us are time poor. That's why Ezyparking's vehicle servicing makes so much sense. While you are on your trip, save money by parking your car off-airport with Ezyparking and have your vehicle serviced by experts at the same time. 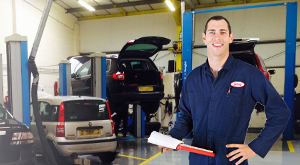 Vehicle Servicing is provided by highly accredited local service centres Carters Automotive and is subject to their terms and conditions. A minimum booking of 3 business days is required to allow for the booking and transfer of your vehicle to the service centre and back.